Every year at Thanksg iving I like to try something new to add to our Thanksgiving dinner menu. If we like it then it becomes a permanent addition to our traditional meal. This year my grandson Dion and I decided to try our had at a Southern Thanksgiving meal staple, Sweet Potato Pie. I’ve never actually had Sweet Potato Pie, but Dion loves it. He says it’s his favorite pie, specially the way his grandmother from Atlanta makes it. 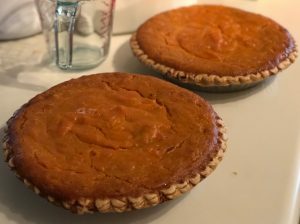 Sweet Potato Pie is a Southern specialty that can be served instead of or beside the traditional Pumpkin Pie which graces just about everyone’s Thanksgiving dessert table. So we searched online for a Sweet Potato Pie recipe; we found hundreds! Each one touting that it was the best of course. Well we experimented with a couple of different recipes and relied on Dion’s recollections of watching his Southern grandma make her pies. In the end by tweaking and patching several recipes together we ended up with our own version which turned out quite nicely if I do say so myself. We’ll share our version of Sweet Potato Pie below, but before we do here are a few things we learned along the way. It might help you out and save you from making the same mistakes we made. Use fresh yams! Not canned yams preserved in sweet syrup! Don’t get me started on this, just ask yourself, would your granny use canned yams? I doubt it! Use Large RED Yams. Not white yams, or purple yams, or Okinawan sweet potato. Just plain old Red Yams! And before you ask, yes there are many varieties of yams and sweet potatoes in the markets. So don’t get fancy, keep it simple, RED Yams. Bake your yams DO NOT boil them! This saves you from peeling and chopping raw yams. BTW have you ever tried peeling and chopping raw yams or sweet potatoes? No? Well let me tell you peeling and chopping wood might just be easier! Most importantly baked yams make a better pie filling, it’s not mushy or watery like boiled yams can be. And you can bake yams for your Sweet Potato Pie up to a week before you actually make your pie. Still not convinced or it sounds too tedious? Remember even though it takes an hour to bake the yams it’s actually a hands off hour so you can do something else like making applesauce, doing laundry, or relaxing in the tub. Baking yams – Place 3 large yams (you wash them first of course) on a parchment covered baking sheet and pop them in a 375° oven. Bake for 1 hour then remove from oven. If you are using it to make Sweet Potato Pie right away peel off the skin and mash the yams to make 2 cups of mashed yams then follow the rest of the recipe to make the pie. If you baked the yams in advance you can either mash it then store the mashed yams in the fridge in an airtight container or place the whole unpeeled yams in a ziplock and refrigerate until you’re ready to mash them for your Sweet Potato Pie. Just like Pumpkin and pecan pies, a Sweet Potato Pie is considered a custard pie; hence it must have some form of milk or cream. 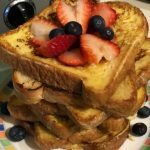 There are recipes out there that call for milk, cream, or half-and-half; but since it’s a truly Southern specialty you should use canned evaporated milk. That’s what they used in the Southern states. Trust me on this you’ll end up with a creamier and smoother Sweet Potato Pie when you use canned evaporated milk. When you bake your pie pay close attention to the timer. Test pie before removing from oven. First nudge the pie – the center of the pie should be slightly softer than the rest of the pie so that it jiggles a bit when nudged. Then insert a knife or a toothpick at the center – it should come out clean but moist. Let baked pie stand for about 30 minutes before cutting it. This will firm it up so sliced don’t fall apart. Better yet refrigerate the pie overnight then remove from fridge about 30 minutes before serving so it warms up to room temperature. I like my custard pies cool I feel it brings out the sweetness. 1 Can Evaporated Milk 12oz. Mix together first 4 ingredients until well blended. Stir in Vanilla, Eggs, and Cinnamon. Pour filling into unbaked pie shells. Bake in a 350° oven for 1 hour or until filling is set and/or tester comes out clean but moist. Let stand at least 30 minutes before slicing. Garnish and serve with whipped cream if desired. Baking yams - Place 3 large yams (you wash them first of course) on a parchment covered baking sheet and pop them in a 375° oven. Bake for 1 hour then remove from oven. If you are using it to make Sweet Potato Pie right away peel off the skin and mash the yams to make 2 cups of mashed yams then follow the rest of the recipe to make the pie. If you baked the yams in advance you can either mash it then store the mashed yams in the fridge in an airtight container or place the whole unpeeled yams in a ziplock and refrigerate until you're ready to mash them for your Sweet Potato Pie. Well perhaps super easy is a bit of a stretch. You do have to put some effort into making stuffed chicken breasts, but not a whole lot, really I mean it. You probably have most of the ingredients in your kitchen already. With just a little bit of prep time (before popping everything in the oven) and a few minutes to make the sauce you will have time to sit down and read a book or take a short nap while it’s cooking. You can serve this dish with a side of pasta for a very satisfying meal. Add a tossed salad and you’ve got a great meal to serve to friends and family! 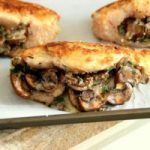 Seriously your main ingredients are garlic, mushrooms, cheese, and chicken what’s not to love? Need more chicken recipes? Try my Chicken Souvlaki Skewers it’s amazing! Add garlic and saute about a minute. Add sliced mushrooms, parsley, salt and pepper. Saute until mushrooms are soft. Horizontally slice each breast at its thickest part. Do not slice through. Leave it attached to form a pocket. 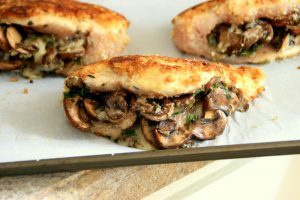 Fill each breast with the sauted mushrooms and seal each breast with a couple of toothpicks. Remove any extra mushrooms from the pan. Leave any juices in the pan. Heat this pan and the juices and add the stuffed chicken breasts. Sear both sides of the breasts until they are golden brown. 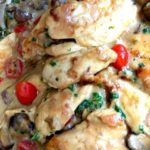 One of my favorite dishes is Chicken Marsala. I’ve tried many different recipes in my quest for the perfect one; tweaking each one until it was just right. 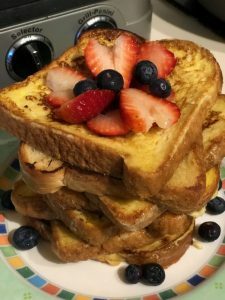 Here is the recipe I use and my family loves it. The sauce in this version is thicker and creamier than other versions due to the heavy cream and corn starch. If you want a thinner sauce please read the notes at the end to see what ingredients can be omitted or substituted. 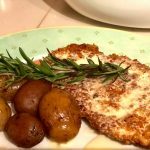 This recipe is very easy to make and should be served soon after cooking. Left overs can be refrigerated, in fact it tastes even better the next day! 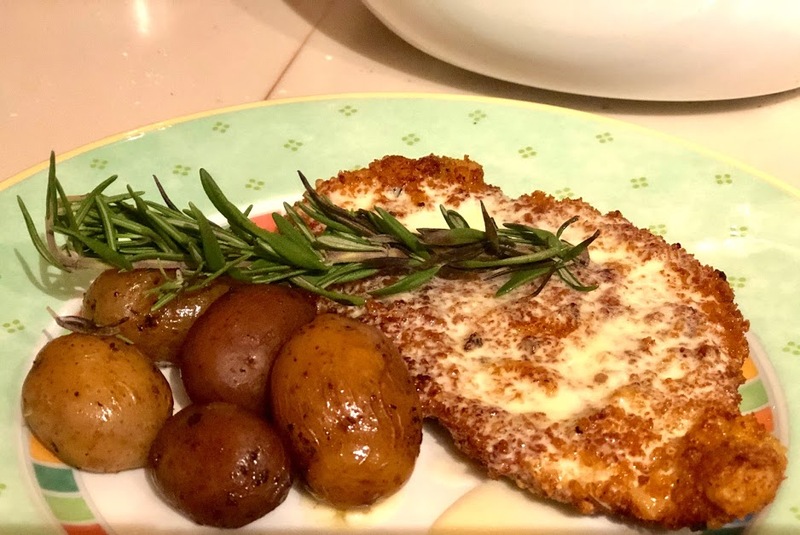 I serve Chicken Marsala with garlic mashed potatoes or my cousin’s “poor man’s pasta” the recipe for that is at the bottom of this post. 1. Wash mushrooms and pat dry. Slice into thin slices. 2. Melt 2 tbls. butter in large sauce pan over medium heat. Add sliced mushrooms and cook until golden brown, about 5-10 minutes. 3. Add garlic and wine to the mushrooms. Lower heat and gently simmer until wine reduces, about 15 minutes. 5. Combine flour, ground sea salt, black pepper, and garlic powder in a shallow bowl. 6. Heat oil and 2 tbls. butter in a skillet over medium heat. 7. Toss chicken tenders in flour; shake off excess; fry in olive oil/butter until cooked thru and is golden brown. 8. Pour Marsala sauce over chicken. Add cherry tomatoes. Simmer until tomatoes are soft, but not mushy. 9. Sprinkle with chopped parsley before serving. * For thinner sauce OMIT heavy cream and corn starch in step 4. Add salt and set aside. Cook chicken as directed. In step 9 BEFORE you sprinkle with parsley stir in 2 more tbls. butter, stir until butter melts. Sprinkle with parsley. 1. Cook pasta as directed on box. 3. Melt butter in skillet over medium heat. 4. Add cooked pasta. Toss in butter until pasta is covered. 5. Add parmesan cheese. Toss pasta until cheese is evenly distributed. Wash mushrooms and pat dry. Slice into thin slices. Melt 2 tbls. butter in large sauce pan over medium heat. Add sliced mushrooms and cook until golden brown, about 5-10 minutes. Add garlic and wine to the mushrooms. Lower heat and gently simmer until wine reduces, about 15 minutes. Add cream, corn starch, and sea salt. It should thicken slightly. If it's too thick add more wine to desired consistency, but not more than another 1/2 cup. Set aside. Combine flour, ground sea salt, black pepper, and garlic powder in a shallow bowl. Heat oil and 2 tbls. butter in a skillet over medium heat. Toss chicken tenders in flour; shake off excess; fry in olive oil/butter until cooked thru and is golden brown. 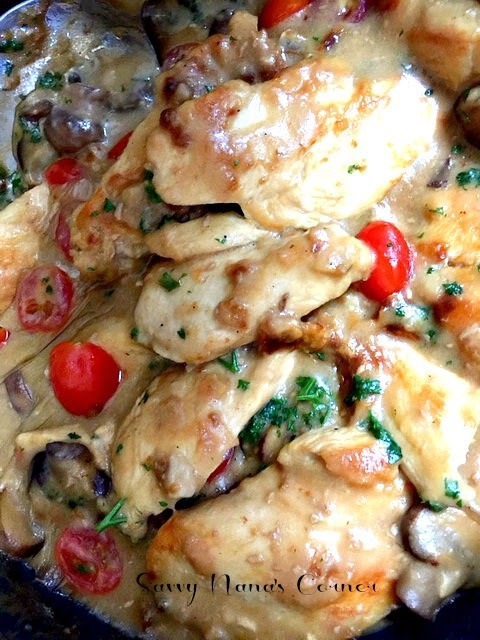 Pour Marsala sauce over chicken. Add cherry tomatoes. Simmer until tomatoes are soft, but not mushy. Add cooked pasta. Toss in butter until pasta is covered. Add parmesan cheese. Toss pasta until cheese is evenly distributed. For thinner sauce OMIT heavy cream and corn starch in step 4. Add salt and set aside. Cook chicken as directed. In step 9 BEFORE you sprinkle with parsley stir in 2 more tbls. butter, stir until butter melts. Sprinkle with parsley.